Although taking photographs with your digital camera is fun, even more enjoyment can result from creating your own prints and sharing them with others. While the printing of photographs could be carried out using a basic inkjet or multifunction device, for increased functionality and ease of use you might prefer a dedicated photo printer such as the HP Photosmart A826 Home Photo Centre model. Despite being fairly compact, measuring 275 x 263 x 244mm (H x W x D) and weighing 2.63kg, the photo printer is not particularly portable as it lacks a carry handle. Shaped a little like a rigid backpack (without the straps and buckles), the unit is coloured predominately white with a bluish-grey front panel that holds a 17.7cm (7-inch) colour touch screen. Situated just beneath this touch screen are memory card slots covering xD, CF, Memory Stick, SD and MMC formats plus a PictBridge socket; print cartridge compartment; stylus for use with the touch screen; and paper output slot. When not in use these facilities can be concealed by the paper output tray. Paper input, with a capacity of 100 sheets (10 x 15, 13 x 18, 10 x 30cm sizes), is located at the top of the unit. The A826 can operate in either standalone mode or connected to a computer, using the supplied software, via USB. Let's take a look at the standalone mode first. Simply inserting a memory card or attaching a camera to the printer allows access to the available content shown on the LCD. You can print an index of the various images; select an individual or group of images for printing; or apply editing and creative enhancing feature by using the stylus to tap on the appropriate option. Editing allows you to crop, remove red eye and adjust the brightness. Selecting the Creative mode brings up options to add a caption, draw lines, superimpose a frame on the image or create an album. The last two options categorise their templates as seasons, kids, daily life and special events. With the appropriate media you can produce panoramic views, photo stickers and CD/DVD tattoos. There is a choice of three print qualities available for selection. Producing a 10 x 15cm borderless print took 55 seconds in Fast Normal, 65 seconds in Normal and 95 seconds with Best selected. Very little difference was detected between the three image qualities which were all good and available for immediate handling. When the computer becomes involved in the printing process you can make use of the HP Photosmart Essential software which includes basic photo management capabilities and editing features. The software builds up a library of images by transferring content from various sources that include memory cards docked in the A826, optical media and a folder on your hard disk. You can resize, rotate, crop and remove evidence of red eye. Other options are available to adjust colour and lighting plus convert to sepia or black and white. You also get access to an online sharing feature for publishing your photos to the Web. Generally I preferred the range of functionality and ease of use when using the A826 in standalone mode. 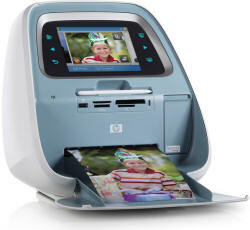 Expect to pay around £199 for the HP Photosmart A826 Home Photo Centre. Replacement Tri-colour inkjet print cartridges have been priced at £14 while a bundle, that includes 120 sheets of 10 x 15cm HP photo paper, will be available for £25. The HP Photosmart software requires Windows XP or Mac OSX 10.3.9 and later with a 233MHz processor, 350MB of hard disk space and 256MB of RAM. Windows Vista users will need an 800MHz processor, 1GB RAM and 900MG of hard disk space.